Join Us!!! We are looking for someone to help us cover Indonesian basketball. Please send us an e-mail. Stapac celebrated IBL title. They overcame Satria Muda in Game 2 of the championship series to complete the sweep of the series. The guests were tied at the half but managed to speed up in last two quarters eventually winning the game. Stapac dominated on the defensive end, holding Satria Muda to just 6 points in fourth quarter. 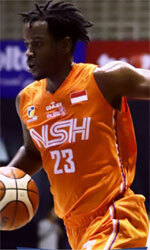 They dominated down low during the game scoring 48 of its points in the paint compared to Satria Muda's 22. Stapac forced 21 Satria Muda turnovers and outrebounded them 49-35 including 21 on the offensive glass. They looked well-organized offensively handing out 22 assists. 29 personal fouls committed by Satria Muda helped opponents get some easy free throw opportunities. American forward Savon Goodman (198, college: Shaw) orchestrated the victory with a double-double by scoring 20 points and 19 rebounds. The other American import guard Kendal Yancy (190-94, college: Texas) contributed with 17 points, 6 rebounds and 4 assists for the winners. Four Stapac players scored in double figures. American forward Dior Lowhorn (201-87, college: USF) replied with a double-double by scoring 25 points and 20 rebounds and international Arki Wisnu (187-88) added 15 points in the effort for Satria Muda. Both coaches used bench players which allowed the starters a little rest for the next games. Stapac rallied past Satria Muda to open win count in the Finals. The game was mostly controlled by Stapac. Satria Muda managed to win fourth quarter 27-25. But it was not enough to take a lead and get a victory that evening. Worth to mention a great performance of American forward Savon Goodman (198, college: Shaw) who helped to win the game recording a double-double by scoring 21 points and 12 rebounds. His fellow American import guard Kendal Yancy (190-94, college: Texas) contributed with 18 points, 8 rebounds and 7 assists for the winners. Four Stapac players scored in double figures. American forward Dior Lowhorn (201-87, college: USF) answered with a double-double by scoring 14 points and 15 rebounds and international Arki Wisnu (187-88) added 16 points and 8 rebounds in the effort for Satria Muda. Both coaches used bench players which allowed the starters a little rest for the next games.